What follows in an edited version of a paper I presented at a conference at the Unversity of Helsinki in 2008. Abraham Maslow (American psychologist 1908-1970): “It is tempting, if the only tool you have is a hammer, to treat everything as if it were a nail.” Tools not only provide the power to shape materials, but expand the dimensions of human intellect. There is magic in the manipulation of real tools and real materials. They create interest in the learner by engaging the hands in the exploration of physical reality and the expression of intellect. We place our children at risk of boredom and diminished capacity by abandoning the commonplace tools that formed the foundation of human creativity. Research on gesture, the field of embodied cognition, and new developments in the study of depression reveal the significance of the varied and rhythmic use of the hands in the development of human intellect. We are made stupid and depressed when our hands are stilled. Most American schools and homes are involved in a risky experiment in which the common tools of artists and craftsmen are abandoned. The Clear Spring School, a small independent school in Northwest Arkansas is different. We are on the cutting edge in the making and use of tools. Our children make their own, from hand-carved ink pens based on the 1885 Nääs Sloyd model series to the looms our children use in weaving and textiles. 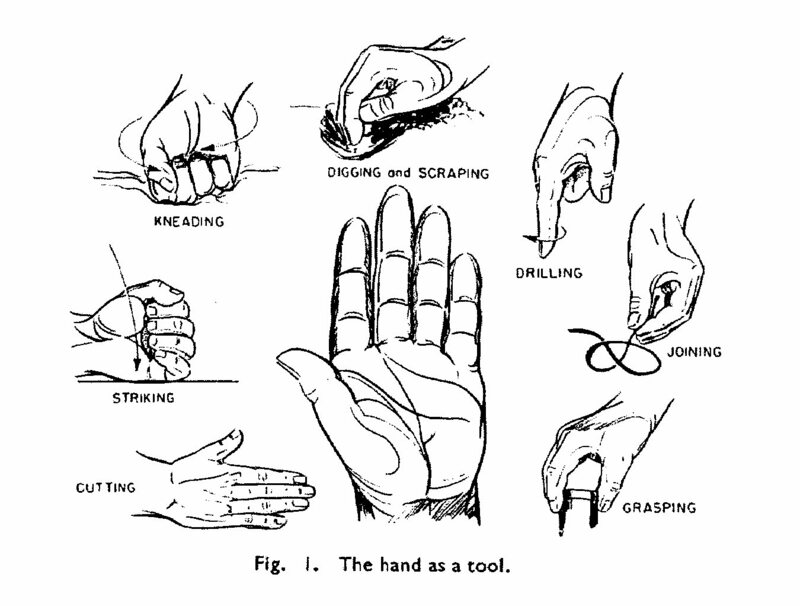 Making tools provides a means to put the hands into action in the classroom. When the child makes the tools used in his or her hands-on exploration there is a depth of interest and understanding that cannot be approached otherwise. The United States, unlike the Scandinavian countries does not have a national curriculum in craft education. While many schools in the US have arts education, often taught by a resource teacher and with little integration with core classroom learning, craft education is extremely rare in schools. For that reason, those of us involved in crafts education are challenged to find a clear rationale for its inclusion in schools. Crafts education must compete for funding against many other more widely recognized educational needs, so part of my mission has been to demonstrate its value within a system that has been skeptical. On the more positive side, not having a standardized national crafts curriculum offers craft teachers the opportunity to be exercise personal creativity. To develop a program like my own would not have been possible in schools with greater responsibility to meaningless national standards. Prior to the 1990’s, wood shops were common in middle schools and high schools but since then wood shops have been discontinued to allow greater emphasis to be placed on academic studies. At this point, schools with wood shops have become rare. But the good news is this: You can play a vital role in the return of common sense learning in schools. According to widely published statistics, about 30 percent of American high school students fail to graduate. An additional, but unmeasured number of our best and brightest students are bored with their high school educations. Add the numbers of disinterested, and deliberately disruptive students who manage to squeak through at graduation, and you might begin to think we could be doing a better job at educating our children and preparing them for their futures. In my own wood shop, as a professional craftsman I never felt that what I was doing was obsolete. Woodworking enabled me to use a variety of skills, integrating the arts, science, history, mathematics and business. It occurred to me that woodworking in school could become central to the learning experience, making all the other conventional studies more relevant and meaningful to children’s lives. If learning were more relevant, more meaningful and more fun, school would more readily engage our children’s attention and more surely lead to their success. As the mission statement of the Clear Spring School suggests, When the hands are engaged, the heart follows. In the fall of 2001, we launched the Wisdom of the Hands program at Clear Spring School to demonstrate the value of woodcrafts as a part of school curriculum. We named the program Wisdom of the Hands in the belief that bringing the hands into direct action on behalf of learning would enhance learning in all areas of conventional school curriculum and for all students, even those planning to pursue college educations. We started at the high school level and over the next two years, expanded the program throughout grade levels 1 through 12. During that time I began my own research on the role of the hands in learning and I discovered that many of my own ideas were widely shared by educational theorists since the mid 1700’s and are very much a part of modern scientific research today. As human beings even from the earliest age, our tools are very much a part of us. They influence our thoughts and capacities and perceptions of self. 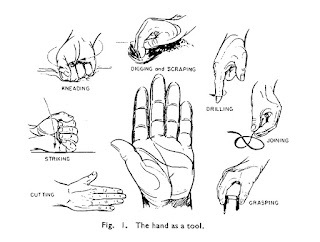 As shown in the drawings from R.J Drillis Folk Norms and Biomechanics, the hands have been the fundamental means through which the world has been shaped, measured, studied and understood. All the actions of machine tools are derived from the motions of the human hand. In addition, while the metric system is based on relative abstraction, earlier concrete systems, including our system of inches and feet, were based on observation of the human hand and other parts of the human body. “The entire open-ended repertoire of human manipulative skill rests upon a history of countless interactions between individuals and their environments, natural materials and objects. The hand brain system that came into being over the course of millions of years is responsible for the distinctive life and culture of human society. This same hand-brain partnership exists genetically as a developmental instruction program for every living human. Each of us, beginning at birth, is predisposed to engage our world and to develop our intelligence primarily through the agency of our hands." Current research in the new field of embodied cognition recognizes that the whole body takes part in the processing of information and human intelligence. The idea that human knowledge is “brain based” or “language based” no longer provides an accurate view of who we are or how we learn. There is something extremely powerful about the engagement of the hands. Woodworkers have noted the therapeutic effect of woodworking, calling their time spent in the woodshop, “sawdust therapy.” By and large we feel better when we take the opportunity to immerse ourselves in the process of creating something from wood. In our nation we have an epidemic of depression and other mental and emotional disorders and use of anti-depressant medications has become common for controlling mood and behavior. I came to my own conclusion that much of the problem has been that we have been out of touch with our own hands, and while being out of touch has disastrous consequences in adult lives, it also has profound detrimental effects on the education of our children. The Wisdom of the Hands program is different from conventional school art classes and is different from conventional woodworking programs as well. Each project is planned in cooperation with core classroom teachers to integrate with current studies. By making our own tools at Clear Spring School, we establish a relationship between the materials drawn from our environment and the student’s growth in confidence by capitalizing on the child’s natural inclinations toward creative activity. We make tools that fit a variety of different categories, each intended to enhance the school’s basic curriculum. Some of the tools enable children to do work, while others are used to expand the children’s understanding of concepts. Some are used for investigation and demonstration of scientific principles, some are used for organizing and collecting data and still others provide additional interest in classroom activities. •Working tools are those that provide the children opportunity to do other projects, often involving crafts. Examples are looms for weaving, knives for carving, pens for learning cursive, and pencil sharpeners, among others. •Conceptual study tools include geometric solids for the study of geometry, math manipulatives, models of the solar system, puzzle maps for study of geography and plate tectonics, abacuses for doing math problems and developing numeracy. •Investigatory tools include windmills for studying meteorology, bug boxes and nets for catching insects, and projectile launchers for the study of trigonometry and physics. •Organizational tools include tool boxes, divided trays for the collection of rocks and minerals, display boxes for collections of insects and numbered stakes for marking plant species on the school nature trails. In addition, the children of all ages have a love of making toys and we use toys as tools to expand interest in specific areas of study. As examples, the children have made trains and various animals inspired by their reading. We have made dinosaurs inspired by their study of dinosaurs, as well as boats for the study of the sea, and cars and trucks for the study of economics and transportation. Much of the success of the program is rooted in the close relationship between classroom teachers and the wood shop. Toy making increases the child’s enthusiasm for learning at all ages. Each project tests new ideas and ends with play. Each child at Clear Spring School has a collection of treasured objects that remind of lessons learned, skills developed. The fact that the classroom teachers are part of the planning process, often suggesting possible projects, leads them to become active wood shop participants, working alongside the students, demonstrating their own engagement in the learning process. Rather than the wood shop being an isolated school activity, it is successfully integrated at all grade levels. By being deeply immersed in exploring the fundamentals of physical reality, and making his or her own tools for discovery, truly no child is left behind, no child is bored, and every child is empowered to engage in creative response to society and the environment. The variety of tools that can be made in the school wood shop is without limit. So what is the difference between making an object and making a tool? Tools are intended to have use and impact beyond the time spent in the wood shop. As an example, the simple tray made for the collection of rocks and minerals is not complete until the contents have been collected, organized and labeled. A loom is not complete until it holds a completed piece of textile art. A toy is not complete until it has been played with and enjoyed, shared and learned from. Tools have particular effectiveness in bringing the hands to work in the classroom far beyond note taking and keyboarding. The hands’ profound impact on learning has been widely ignored in American education, but may also offer the pathway to effective educational reform and renewal. Clear Spring School was founded in 1974 in the small town of Eureka Springs Arkansas to serve as a laboratory to explore new principles in progressive education. It serves 80 students from pre-school through high school. It is accredited though ISACS, Independent Schools of the Central States and through NAIS, National Association of Independent Schools.